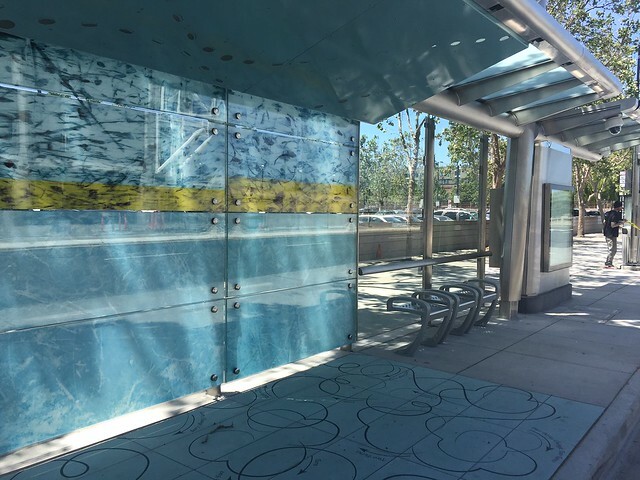 ​A series of art and design enhancements is an important feature of the Alum Rock-Santa Clara Bus Rapid Transit Project. Art reinforces the identity of the transit line while strengthening the unique character of the stations as neighborhood landmarks. The art contributes to the vibrancy of the cityscape, promotes neig­hborhood pride, and creates engaging experiences for pedestrians and transit users alike. The artists explored the transit corridor and surrounding neighborhoods by bus, car, and on foot as well as delving into historical archives and conducting an intensive community engagement process. Local residents participated in more than 15 stakeholder community meetings which led to the artists following up with people throughout the corridor. On behalf of the project, Merge collaborated with local artist Corinne Takara of Okada Design, who assisted with pattern concept development, community outreach, research, and engaging 12 elementary school classrooms with close to 400 students. Mary Rubin with the City of San Jose's Public Art Program was instrumental in the process. Through this process, storylines emerged that are unique to each station. The artists looked for stories that are both representative of each station’s context and not necessarily widely known. 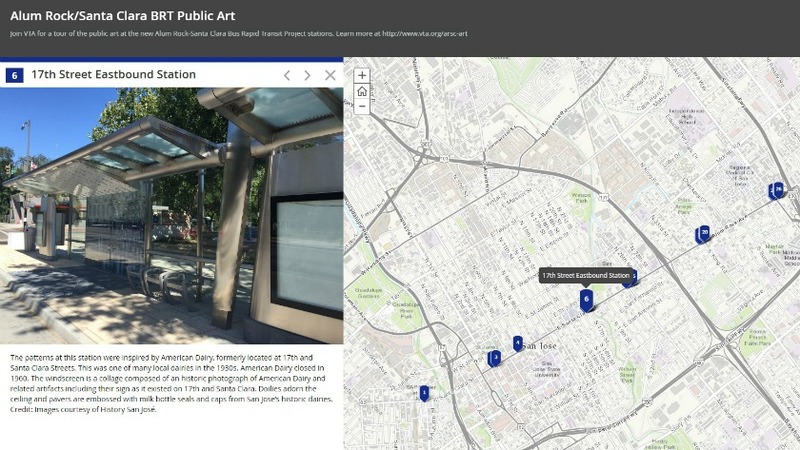 Click here to view a virtual tour of the public art in the corridor, using an interactive map to learn about the art at the stations you use. Merge Conceptual Design is an artist collaborative founded by Franka Diehnelt and Claudia Reisenberger in 2003. Merge mainly focuses on public art installations. Merge’s design process involves deep research on local conditions, extensive community engagement and strong conceptual development. Based on specific project opportunities, the artists use many different media in their installations. The work often focuses on a sense of awareness of the urban and natural environment. See more of their work at www.mergeconceptualdesign.com. VTA thanks the artists and Mary Rubin with the City of San Jose’s Public Art Program for their help with preparing this virtual tour of the Alum Rock/Santa Clara Bus Rapid Transit public art. Each station pair—eastbound and westbound—shares a dominant color as a background to the patterns. This helps orient passengers and serves as an additional landmark. Inspired by skate traces and puck scuff marks created by San Jose Sharks hockey players, the windscreen is a montage based on photographs of the ice and the textures of the surrounding rink, taken after a Shark’s hockey practice. A hockey puck skips across the ceiling panels. The paving pattern is marked with figure skating’s classic school figures. Representing San Jose’s history of agricultural innovation, the paving pattern is inspired by historic seed packet designs from Kitazawa Seed Co., founded in San Jose in 1917 and originally located on North Market Street near the station. From 1942 to 1945 Kitazawa Seed Company was forced close due to WWII. The Kitazawa family, along with all other Japanese-Americans, were moved and put into relocation camps during that time. After the war Kitazawa Seed Company began selling and shipping seeds across the United States. Read more on Headways, VTA's blog. Credit: Images of seed packages were provided by California History Center Foundation at De Anza College; images used with additional permission from Kitazawa Seed Company. Credit: Information provided by Dave Bennet and Dag Spicer from the Computer History Museum in Mountain View. The patterns at this station were inspired by American Dairy, formerly located at 17th & Santa Clara Streets. This was one of many local dairies in the 1930s. The close proximity to the plant meant that milk spent less time in transit, where it might be tainted. Within just 12 hours, the milk was pasteurized, bottled and delivered to customers. The industry declined with the suburbanization of the area, and American Dairy closed in 1960. The windscreen is a collage composed of an historic photograph of American Dairy and related artifacts including their sign as it existed on 17th and Santa Clara. Doilies adorn the ceiling and pavers are embossed with milk bottle seals and caps from San Jose’s historic dairies. Credit: Images courtesy of History San José. Art patterns have been inspired by artifacts of Vietnamese, Portuguese and Mexican games played in this ethnically mixed neighborhood. The game images represented were recorded in the community: Vietnamese Bau Cua Dice, Portuguese Sueca Card Game score cards and Mexican Lotería cards. Credit: Images of Loterí​a cards used with permission of Don Clemente Juego de Lotería. All Rights Reserved. The words and designs of all playing cards are registered trademarks and copyrights of Martha Maria Sanchez Quiroz and licensed to Don Clemente. All Rights Reserved. The area called “Five Wounds,” after the Five Wounds National Parish church, has one of the largest Portuguese American populations in the nation and has an identity deeply rooted in Portuguese culture. The design incorporates lace depicting crowns and doves as well as lace doilies, all made by community members of the local Portuguese Crochet Group meeting at the Portuguese Organization for Social Services and Opportunities (POSSO). Credit: Images and items provided by the Portuguese Organization for Social Services (POSSO) and POSSO crochet group. The patterns at this station reference the nearby San Jose High School, California’s second-oldest high school. The "Big Bone Game" is the annual football game between San Jose High School and Abraham Lincoln High School, held since 1943. The trophy, in the shape of a bone, references the trophy of the first game, which was a large steer leg. Additional features of the design evoke other aspects of San Jose High: The mascot, the bulldog; the class song as taken from an early San Jose High School commencement program; names and graduation years of notable alumni; and graduation ceremonies with the tossing of the mortar board caps in the air. Read more on Headways, VTA's blog. Credit: Information provided by San Jose High Bulldog Foundation. Inspired by Mexican heritage told through the traditional art of papel picado, windscreen patterns depict mariachi instruments and Mexican folkloric dance. Patterns include the hummingbird (regeneration and strength), monarch butterfly (migration) and marigolds (fragility of life). The ceiling and paving show the important trio of agricultural crops known as the “Three Sisters”: beans, squash and corn set within traditional papel picado patterns. The artists created the papel picado design elements in collaboration with San Jose artist Rick Moreno. Credit: Information provided by School of Arts and Culture at Mexican Heritage Plaza. Told through the traditional art of papel picado, windscreen patterns evoke Aztec and Ohlone traditions recorded in the neighborhood such as Mexican New Year and Día de los Muertos. The ceiling depicts cacti and the paving shows yucca blooms set within traditional papel picado patterns. The artists created the papel picado design elements in collaboration with San Jose artist Rick Moreno. Ohlone Indians were among the earliest inhabitants of the Bay Area. The tribe known to be located in the vicinity to this area was the Tamien. The Tamien tribe was estimated to have had 1,200 members that spoke seven languages at the time the Spanish began to settle in Santa Clara County. As hunters and gatherers, they lived on this land for almost 4,000 years. The Muwekma Ohlone maintain a Tribal Council in San Jose, and continue to re-establish themselves as a federally recognized tribe. This station area is home to a number of African American churches. A unique tradition in these churches is the wearing of “church hats,” beautiful and ornate hats that are worn especially for high religious holidays. The artists documented hats and their owners in a photo shoot at St. Paul Missionary Baptist Church. The photos were adapted into silhouettes and applied to the windscreen and ceiling. Hat boxes pattern the ground pavers. Credit: Information provided by St. Paul Missionary Baptist Church. The farm labor organizing efforts of Cesar Chavez, who used to live in the area, and other local activists inspired the designs at this station. A landscape from a 1967 United Farm Workers’ Movement letterhead provided by a community member formed the background to this design. The landscape is expanded and overlaid by a design composed from the traditional plaid of farmworkers’ garments as well as fruit and crops. Credit: Information and letterhead image provided by the Garza Family. Alum Rock Park is located in the foothills of San Jose at the end of Alum Rock Avenue. Founded in 1872, it is one of California’s oldest municipal parks. From 1890 to 1932 it was a nationally known health spa with 27 mineral springs, an indoor swimming pool, tea garden, restaurant, and dance pavilion. The Alum Rock Railroad once ran from downtown San Jose (starting at Santa Clara Street and McLaughlin Avenue) along Alum Rock Avenue and ultimately to Alum Rock Park. A round trip cost 25 cents. Starting operation in 1896 as a steam railroad, the railroad was upgraded to an electric system in 1901 and ceased operation in 1931 due to increased car ownership in the area. The patterns at this station are inspired by vintage postcards of Alum Rock Park, its topography, the Alum Rock Railroad, and thenardite and mirabilite crystals found at the park that were originally mistaken for alum and gave the park its name. All elements are composed in the shape of a Victorian wallpaper that would have been typical for the turn of the century. Credit: Vintage photos were provided by the California History Center Foundation, History San Jose, and the California Room of the San Jose Public Library. This station is inspired by the tradition of and the charrería, a competition similar to rodeo. The artists found inspiration in a neighborhood store that serves this tradition, and interviewed a Mexican bullfighter who lives in the area. Another aspect of this culture is a specific style of music: Los Tigres del Norte are one of the most famous Norteño bands and hail from this area. The music is related to polka and corridos, with the accordion and bajo sexto six-string bass guitar among its characteristic instruments. The pavers are imprinted with a charro’s silhouette and coiled lassoes, and the windscreen and ceiling evoke the patterns that decorate wide brimmed sombreros and other typical charro clothing. Credit: Information provided by the Tenes Family. Inspired by low rider custom cars popular in this neighborhood, paint schemes and engraved chrome details represent the East San Jose car culture that is still an important part of this neighborhood’s identity. Pavers depict an automotive engine as seen under the hood of a low-rider car while the windscreen and ceiling, the latter created by San Jose artist Raul Delgado, depict classic detailed car paint designs. Car culture was an important aspect of the American identity when neighborhoods in East San Jose developed in the 1940s and 1950s. From drive-in-movie theaters to drive-in diners, a distinguished low rider culture emerged which included a distinct aesthetic. The first low rider club in San Jose was founded in 1974. Within five years there were more than 40 car clubs on the east side of San Jose. Story and King roads became the epicenter of the local low rider culture. Read more on Headways, VTA's blog. In 1851, Alanson Story established a 380-acre farm at a location that is now south of Story Road and east of King Road. This was the first farm located in this area, and Story Road was named after Story’s homestead. The subdivision that followed about 100 years later in the area chose storybook names for street names, including Bambi Lane, Cinderella Lane, and Peter Pan Avenue. Intrigued by memories of community members, the artists found several fairytale like images in various locations around the area. The storybook theme is referenced with a Quinceanera Cinderella Carriage (as found in front of a local store). The carriage is pulled by the deer and surrounded by vines found on an oldstove at the Hyuck School, the first school in Alum Rock. Although now only a memory, the sign from the neighborhood's Story-Book Market makes an appearance as well. Credit: Images Courtesy of History San José and Tanya Freudenberger. Reflecting the proximity to Reid-Hillview Airport, the designs at this station are inspired by small-propeller aircraft housed at the airport. The artists arranged various propeller types to form delicate patterns reminiscent of typical aircraft patterns, which the artists recorded in the surrounding neighborhood. Reid-Hillview Airport was built in 1937 by brothers Bob and Cecil Reid, encompasses 179 acres of land, and hosts more than 250,000 arrivals and departures every year on its two runways. Credit: Information provided by Sharon Sweeney and Carl Honaker. The patterns at this station reference the orchards that once covered the area as well as the flower traditions important to the local Asian community. Plum, apricot and peach branches are part of Tet, the Vietnamese New Year celebration. The origami lotus flower is inspired by the artists’ encounter with a nun at the nearby Duc Vien Buddhist Community Pagoda, where she demonstrated how to fold an origami lotus flower, an important symbol in Buddhist tradition. Looking up passengers will see a ceiling of orchard tree branches while below them is a lake with blossoms floating on its surface.